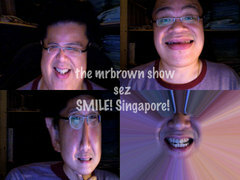 This mrbrown show is sponsored by yearbook.com.sg, Singaporeâ€™s very own â€œSchool Reunionsâ€ site. This entry was posted Wednesday, June 14th, 2006 at 6:40 am and is filed under Matters of National Importance. Responses are currently closed, but you can trackback from your own site. Their latest podcast on “Smile and Speak Good English” is indeed, in my point of view, the best podcast they have ever made…. Wahlau … buah tahan! Laff until lau jiau! a funny podcast by Mr Brown, if you have not come across it yet. love the last part about the singapore smiles… the foul language is funny. and the mee pok seller- whoo!` powderful man…. although I’m not a follower of your blog/articles/podcasts, you’ve outdone yourself again as with the previous ‘ter kuay (Gomez parody)’ once again. Cheers! Bak cho mee ze wua! You guys need additional writers for your broadcast? I failed to even get talkingcock.com to select my work for publication. You want a loser with ter gua? kekekekeke….write to me if you are bankrupt of all ideas! a real funny podcast if there ever was…. walau sibei funny haha! Haha lin ahmah laosai kaobei ! Nin nah bu tio hoot!